1 Mend your clothes and home décor items instead of throwing them out! Mend your clothes and home décor items instead of throwing them out! In order to save money, make sure that you take the time to fix any small rips and tears on your garments or on other textile items at home instead of throwing them out and rushing off to buy replacements! This is the sensible thing to do in the age of overspending and overconsumption! Before you throw out the fabric scraps left over from your latest project, think about ways in which you can use them for another project. Use even the smallest pieces of leftover fabric for some fun stuff like toy clothes, bookmarks and other decorations. Before you throw out your old blanket, curtain or tablecloth why not think about ways in which you can make them into something brand new instead. Work on a wonderful quilt or other home décor item. The Internet is full of ideas for repurposing old textile items into beautiful new ones, so go ahead and have fun and make a brand new garment or other item, and save money at the same time. The same goes for old clothing too. Toss them in a box, and you will see how handy they can be when you are replacing a broken zipper or need to sew on a missing button. Make fabric diapers instead of using disposable ones. Try making your own cloth diapers from any leftover linen you have. You will be amazed at the savings you can make when you stop buying and using disposable diapers for your children! When you hear about a garage sale, make sure that you go and look for materials and accessories for your sewing projects. You can find some excellent clothes, fabrics and materials at an excellent price. Most stores keep the leftover fabrics which have been cut wrong, or which have some kind of small defects. You can get some great pieces of fabric at half price or even cheaper, so next time you are at your local fabric store – make sure you ask the staff about any discounted leftover fabric they have. 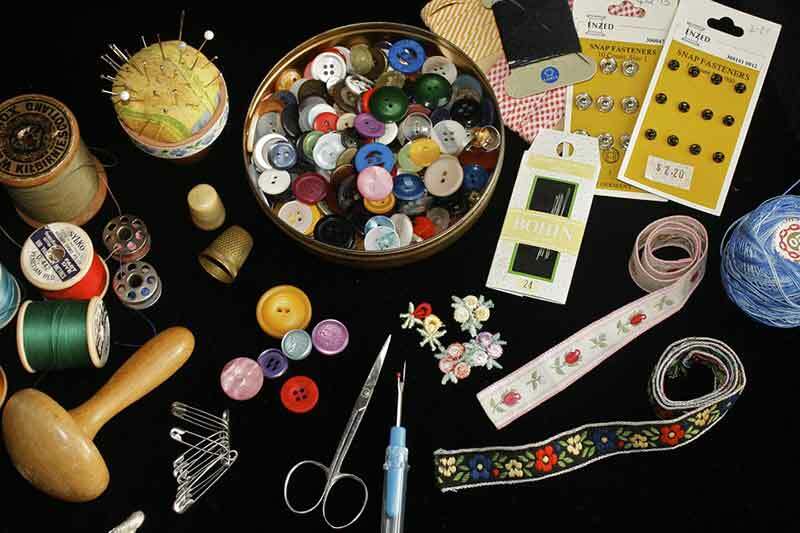 Find some true cheap treasures at the thrift store, such as cheap fabrics as well as garments which can repurpose and use for your next project, as well as various inexpensive sewing accessories for your supply case. Most of us should pre-plan their larger purchases, but even buying an easy to use basic sewing machine can put a strain on the budget. However, in the day and age of mobile and online shopping, there are very quick and easy ways to ensure that you get the best deal or find a discount coupon for the fabric or other item you are looking for. Websites, browser extensions and mobile apps such as: Honey, TopCashback, Ebates, Invisible Hand, Slice Watch, CamelCamelCamel and other cashback and coupon finding services. Once you install them or shop through their websites, you will quickly be offered price comparisons, discount information as well as automatic coupon searching. Most of these shopping tools will also send you notifications when an item of your choice is being offered with a discount too. It is amazing how much money you can save by using these smart shopping tools and services. If you are not into online shopping and the new technologies make sure that you ask for newsletters from your local fabric and craft stores, so that you get the latest information on discounts and coupons. By taking the time to clean and grease your machine on a regular basis, you will ensure that it works properly and can prevent a number of different problems which can require costly repairs. The better care you take of your machine – the longer it will serve you, so save money by taking regular care for it. Make sure you set a fixed sum of money for your monthly sewing, and stick to it. Don’t be tempted to overspend because you have found an inspiring new project which requires more expensive fabric and materials. It is recommended that you keep a log or diary of all the sewing items you buy per month, so that you can ensure that you fit into the set budget. Make sure you play around with the patterns for your next project, so that you arrange them in the most efficient possible way before you actually cut the fabric. The better you position them, the lesser fabric you will have to throw out at the end of the cutting. This is an excellent way to get rid of any unused fabrics or accessories and get others which will come in handy for one of your future projects. Use Flickr, Reddit or sewing forums for this purpose. Split the money for the purchase of a fabric line or yard bundle with a friend, so that you can get the material of your choice but at half the price. Use free online tutorials or borrow a book from the library for your sewing projects. You can find numerous useful online tutorials, or ask for the sewing book you really want at your local library – chances are they will have it. These books often include the actual pattern pieces at the back, which will help you save a lot of money for purchasing them instead. There are gorgeous free patterns, and sometimes there are even entire collections of free sewing patterns such us ours Free Lingerie patterns collection. Patterns usually retails for 12$+, so if you find the pattern for free you will have more money for fabric, notions or supplies! !